Because an increase in stopping-safety and a decrease in expense is our goal. Help protect your family and others by ensuring your brake system is up to par. Your brakes are your first line of defense in your vehicle. Don’t wait until after a dangerous situation to increase your safety. Prolong the life of your brake fluid and brake system. BrakeShot works to prevent corrosion before it can cause expensive damage. Save on brake fluid costs, as well, since it also transforms your average or cheap brake fluid into a high tech, high grade, just like the expensive brake fluid. Just one BrakeShot treatment will allow you to prolong the life of your brakes by providing instant protection against brake system corrosion and restoring your ability to stop safer. What is everyone else saying about BrakeShot? “Today most technicians know that corrosion in a brake system causes a wide range of problems. In the past shops waited until the copper content of brake fluid was high enough to cause problems (200 ppm), before they changed out the brake fluid. 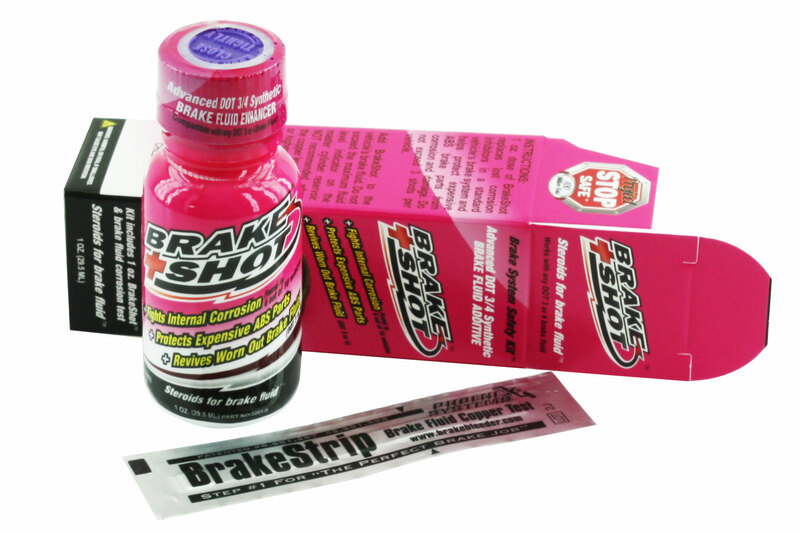 BrakeShot is 1 oz of concentrated brake fluid inhibitors used to treat 1 liter of worn out brake fluid. Worn out brake fluid is defined as any brake fluid that tests between 10 to 100ppm copper content. 200ppm copper content and above means brake fluid is broken and should be changed before adding BrakeShot. BrakeShot extends the life of brake fluid and helps protect the brake system (ABS) from dangerous corrosion. The BrakeShot formula uses patent-pending inhibitors to better protect areas in the brake system most vulnerable to corrosion. When used as directed, BrakeShot protects the calipers, master cylinder, ABS, brake lines and other metal parts from corrosion and degradation, which reduces the risk of brake failure and leads to longer brake system life. Doesn't a brake flush removes debris along with the fluid exchange? This is true. BrakeShot should only be added when a brake flush is not an option or after a brake flush has been performed. What does BrakeShot do for my brake fluid? BrakeShot can treat any vehicle with DOT 3,4 or 5.1 brake fluid. When do I add BrakeShot? You add BrakeShot to any brake fluid that is under a copper corrosion level 200 ppm. You can even add it to brand new brake fluid to boost the quality. How long does it take to treat my system? Have you ever added food coloring to water? BrakeShot’s patent pending formulation disperses through your brake system much like food coloring disperses in water. BrakeShot is added at the master cylinder reservoir. Testing shows that it takes 1 week to treat the furthest caliper in an ABS vehicle and 3 weeks in a non-ABS vehicle. How do I use BrakeShot? 1. 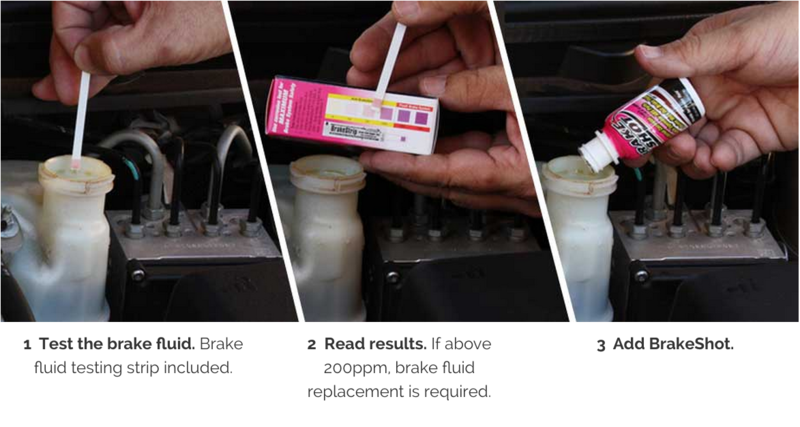 You test your brake fluid with the included BrakeStrip brake fluid test strip: Remove the cap from the master cylinder reservoir and dip the individually protected BrakeStrip in the brake fluid for 2 seconds. 2. Read the results. Wait for 60 seconds to check the results of the BrakeStrip test pad with the color chart on the side of your BrakeShot box. If the pad shows a color that is less than 200 parts per million go to step 3. If pad shows a color that is more than 200 parts per million, your brake fluid reuires a brake fluid exchange so that you can get the maximum effect out of your BrakeShot brake fluid enhancer. 3. Add BrakeShot if your copper corrosion levels were 200 parts per million or less. If your copper corrosion levels were 200 parts per million or higher AND you have flushed your brake system with all new brake fluid, add BrakeShot to that new brake fluid to make it an even higher quality fluid. Is BrakeShot only for older cars? Absolutely not. Brake Shot is compatible with new and used brake fluid and does not reduce compliant brake fluid properties. 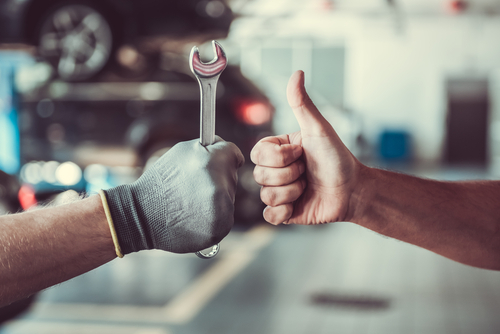 Because some car manufacturers tend to cut costs by using a lower grade brake fluid, we recommend BrakeShot to upgrade your fluid for increased safety and to reduce chances of expensive brake system repairs in the future. Yes. BrakeShot has been certified by ABIC Testing Laboratories, which specializes in brake fluid testing. You can read the lab findings here. We safeguard stopping power by developing the latest in breakthrough technology. Phoenix Systems holds over a dozen US and foreign patents as a result of our pioneering efforts in the automotive undercar industry. Every tool we make utilizes new patented technology, there are no “me too” tools in this industry. A 1989 Chevy pickup brought Phoenix Systems into existence in 1994 when Jon Petty, the company’s founder, developed a rudimentary Reverse Fluid Injection system to bleed a clutch system. That early prototype was developed and refined into the multi-patented product selection of brake bleeder Reverse Bleed Technology systems used by thousands of professionals and at home mechanics across the country. So effective is the reverse brake bleeder line of products that the MAXPRO is now considered a standard issue tool in the US military. In November of 2000, Phoenix Systems released another ground breaking piece of technology, the BrakeStrip. After spending thousands of hours on research and development, Phoenix Systems developed FASCAR Technology, which gives an automotive technician the ability to check the quality of a vehicle’s brake fluid with a simple and easy to use paper strip and color code system. This revolutionary copper test system follows Motorist Assurance Program (MAP) guidelines for brake fluid testing.